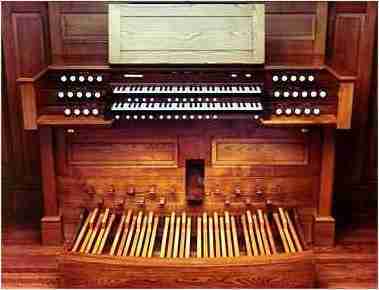 The suggestion that the only place for the new organ at Christ Church Pittsford was at the west end of the church was met initially with some scepticism by the congregation but, once the whole question of the reordering of the church was considered, the logic became evident. The terraced console is an elegant solution to the lack of height and allowed the sizable manual departments to be disposed one above the other behind an 8' facade. 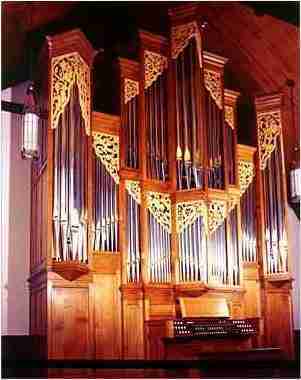 The organ has mechanical key and drawstop action, but with additional drawstop solenoids for pistons and eight levels of memory. We often work together with a church in the design of the carving for the pipe shades, and this is a particularly intriguing example of such cooperation. The then organist of the church, Michael Messina, and the treasurer, Catherine Shoemaker, suggested the inclusion of symbolic elements in the carving, which we were pleased to do. The outer pedal towers have a vine on one side and a sheaf of wheat on the other, representing "I am the true vine" and the parable of the sower as well as the reaping of souls. The pedal flat on the left has the inscription INRI for Iesus Nazarenus Rex Iudaeorum (Jesus of Nazareth King of the Jews) as posted on the Cross by Pilate. The right Pedal flat has the symbol of Christ Church and the Church in general, the Cross itself. The upper centre tower has a butterfly on the left, symbolising the Resurrection, and a crown on the right for the victory of the Church over evil. To the left of these on the upper level is the monogram XPI, the first letters of the Greek for Christ. To the right is Alpha and Omega, the First and the Last. The lower centre tower has three fishes on the left, a symbol closely associated with Christ and a reminder of His command to Peter to become a fisher of men, as well as the feeding of the five thousand. On the right a dove, the ancient symbol of peace. To the left of this is the Pascal Lamb, and to the right the pelican feeding her young from her own flesh, representing the sacrifice of Christ for humanity on the Cross.